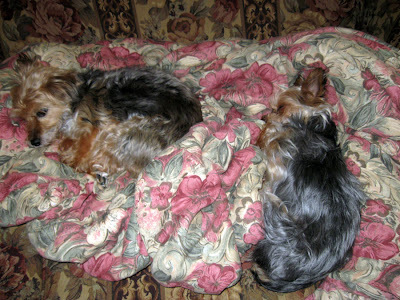 Then, Sunday morning when DH went to work early in the morning, the smaller of our two dogs was sick. Nothing out the ordinary. They are both Yorkshire Terriers and she is 6 pounds and her sister is 10 pounds. After she was sick, she laid on the couch all day and did not move. I thought that was very odd. She was also having problems moving her hind legs. Sometimes, their patellas come dislodged and then go back in. Yesterday, she continued to lay and not move, not eat, not drink. Poor precious baby. She's and her sister will be 10 in May. That's poor baby on the right. Sissy is close by. Of course, off to the vets we go. Blood work, urine test, etc... first high level of proteins in urine. Not good. Gave her IV fluids and then we mentioned we sometimes get ticks in the yard but have not seen any in a while. Did a Lyme test and sure enough, she has Lyme disease. They gave her medicine and we went home. By the way, we figure we would test her sister while we had them both there even though she was acting fine... Congratulations, both your dogs have Lyme disease. Ugh. $400+ visit later, we came home with some medicine for them both. She started doing better right after the medicine last night and today. It was almost unbelievable. She was eating, drinking, moving, etc... Then the vets called today. Her blood work was back and her liver levels are very high among some other levels. They wanted me to bring her down and they want to keep her until Friday. Give fluids and antibiotics intravenously. I said, "But, she's doing so much better." But I knew it was for her best. So, for the first time ever, the sisters are now separated. Her sister is handling it better than I thought she would. I can't imagine 3 days without my spoiled girl. I have to keep telling myself, "this too shall pass". There are times when expenses go awry and you just have to do things for the greater good. I can always start selling some fabric :-) By the way, here she was before she went to her "SPA Visit" for a couple days as I told her. It was smart of you to test both girls at the same time for Lyme disease; you'll be on the lookout for problems from now on and won't have to go through the stress of testing at a time of illness. awwwwww poor baby. Glad you found the problem quickly. 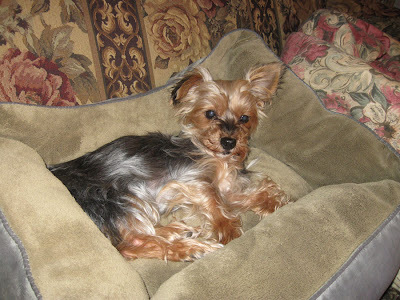 I love Yorkies but have never gotten one. She will be home soon and feeling much better.